As silly as this may sound to people who have never experienced a mental health issue, when one is used to a dystopian inner world, feeling happy for a consistent period of time can be a bit of a worry. For those of us who’ve had mental health concerns in the past and a baseline mental state that just allows us to lurch through life in a state of veritable chaos, calm and pleasant periods of time are a source of anxiety because we wonder if the next mental health calamity is just around the corner. One might consider psychological temperature-taking should be done just like going to your general practitioner (GP) once a year for a physical exam. However, just as many avoid the GP for fear of finding physical health problems, the same fear may prevent us from considering mental health check-ups. Recently, I decided to treat myself to a mental health check-up because I felt like I’d been avoiding it. Since my mother died from aggressive metastatic small cell lung cancer last year, I threw myself back into life as best I could; maybe a bit harder than I’d meant to. 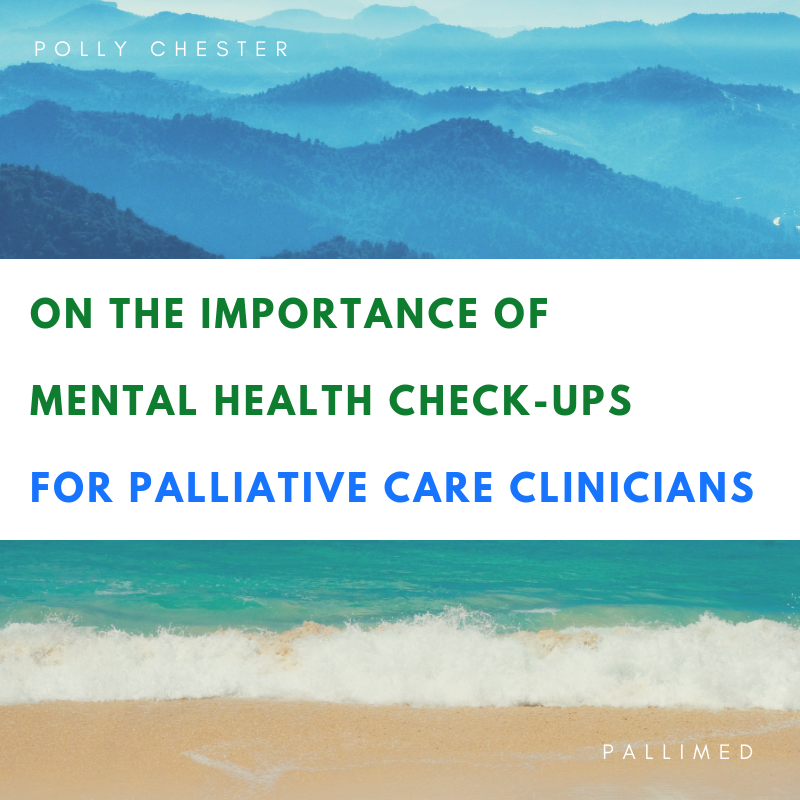 I didn’t just go back to my previous teaching and lecturing three weeks after my mum’s death, in addition, exactly six months after that day, I also started a new clinical role – specialist palliative care social work in a local hospital. Advice from relatives and friends rang in my ears: “Be careful and make sure you access mental health support - I found that I threw myself into too much study and work after my mum died” and “It might be too soon for palliative care practice – six months is the minimum time you should wait after a death for a big change like that”. But I did not listen, did I? It could have been my workhorse ethic or my fear of missing out (FOMO) on professional opportunities that lead me to do six months’ worth of 50-hour weeks, and predictably pay for it with a breakdown halfway through the year. I was totally exhausted, but there was an eerily calm surface on the emotional waters where I’d expected a violent storm. I’d just spent six months developing a specialist model of care for social workers in palliative care and met dozens of incarnations of my mother - people who had gone from feeling ostensibly well and completely ignorant of their cancer to a terminal diagnosis within a matter of days or weeks. I couldn’t understand why I was feeling so… unaffected. I cared deeply about every patient who came into the ward and felt immensely privileged to be of practical help in some way, but I wasn’t feeling retraumatised by seeing so much death and this came as a surprise to me. So, this is really what brought me back to the psychologist – had I accidentally turned into an unemotional sociopath during the past year? She’s a sensible woman, my psychologist, very compassionate and warm but also not afraid to point out when I’m talking nonsense. There were two key points that came from our discussion. Firstly, that the reason I wasn’t reacting to every patient’s death in the same way I had reacted to my mother’s death was because I’d properly integrated the experience of the trauma. During the first six months of my work, as I quietly worked with grieving families I had felt a bit guilty, like I wasn’t responding to death properly – with the sadness that each one deserved. This feeling was reinforced by all the families of patients who were baffled by how the team and I could do the work that we do every day without going insane with sadness. How you manage your recovery following a grief experience really is all down to properly taking care of yourself during; feeling everything that needs to be felt, acknowledging the reality and the ubiquity of change; of endings and beginnings, and letting yourself grow around these. Grief - whether it be for a person, place, object, feeling, body part or function - doesn’t shrink or disappear – you absorb it. With respect to assimilating profound emotional experiences, with every one, I visualise my heart muscle developing another layer. It’s not an airy-fairy, conceptual love-heart. I imagine the functional one in my chest, taking up more space than before and pulsating with even more energy with every experience extreme loss or joy because it is these contrasting experiences that give life colour, shape and texture, and build resilience. I have found these experiences have led to feelings of vitality and a more compassionate way of being with people. I still get tired; get deeply annoyed at hard-right politicians; get PMS; get anxious about having too many social activities in a weekend; get irritated when I accidentally buy a mouldy potato or have to queue for too long for my Hare Krishna takeaway food on a Friday night. But overall, these kinds of things don’t get me fired up as much as they would have a couple of years ago, and for nowhere near as long. Experiencing profound grief and loss, when it’s been processed safely and properly, can lead to great gains in emotional maturity. Which brings me to my second key point – how I avoided coming to see her because I was a afraid I might break the spell and go back to where I was before. Through our discussions I learned one must never be afraid to revisit pain and that fear can block capacity for critical self-reflection and therefore prevent growth. I realised I wasn’t just afraid to get a mental health check-up – I was actually a bit afraid to talk about any of my past pain because I was in a better and different space now and therefore found it embarrassing; I was afraid that talking about it would re-invigorate some mental health issues, or officiate my imagined sociopathy; that I’d done the wrong thing by engaging in doing the work that I now do. This was why it was so important for me to talk about it, and to continue to talk about it. We don’t learn when we’re comfortable – we learn when we are scrambling over edge of what we’re are capable of into something new. We must never fear what we were in the past, because it’s those failures that make us who we are. So, in summary, my mental health check-up revealed that I’m still a chronic over-thinker and hopefully a bit wiser than I once was. We’re all about as ordinary and complex as each other; just muddling through life with the resources and opportunities we’ve been bestowed by our genes and the environment. To make the most of life and to ensure you’re processing the bizarreness of it all, occasionally bouncing things off a psychologist just to keep it real is really not a bad idea. 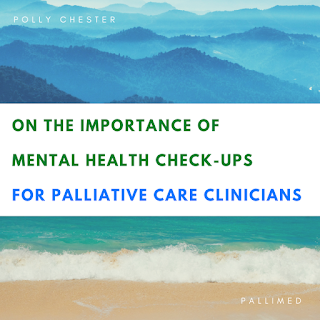 Polly Chester, B.Soc.Wk, is a clinical palliative care social worker and academic, living and working on the Gold Coast in Australia. Up until 2018, when she took on too many different jobs at the same time, Polly used to write and publish blogs on a regular basis, and hopes to re-establish regular writing practices again in the near future. Primary research interests include implementing complex interventions in health practice and improving interprofessional practice approaches in palliative care multidisciplinary teams.